Dogs love these delicious chicken-flavored chews . They contains no additives or preservatives. 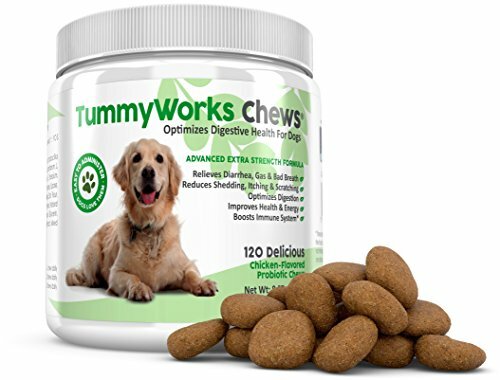 Choose TummyWorks and help your dog's tummy to work as it should, boosting their health, energy and happiness. OPTIMIZES DIGESTIVE HEALTH: Extracts more energy and nutrients from your pet's food, improving health and happiness. DOGS LOVE THESE DELICIOUS CHICKEN-FLAVORED CHEWS: Contain no additives or preservatives. RESULTS IN 30 DAYS OR YOUR MONEY BACK: 100% Risk-Free guarantee. Made in USA. If you have any questions about this product by Finest For Pets, contact us by completing and submitting the form below. If you are looking for a specif part number, please include it with your message.